Under the shadows of Beverly Smith-Lopez! The outstanding Belizean artist, dramatist and playwright of Belizean artistic renaissance of the 1970s, the late Beverly Smith-Lopez, is remembered here at Belizean Legends as a true social activist of Belize’s political past. When Belizean politics raged throughout a period of a monopoly-controlled radio station called “Radio Belize”, and a political climate that created a mood of distrust and fear among the masses of the Belizean people, Smith-Lopez’s monologues in poems like Sandra Coye’s “Genesis of Destruction” and in her voice in Evan X Hyde’s plays like, “Haad Time,” connected the dots for the masses of the Belizean people. The incomparable Smith-Lopez even in her immortality has reminded many of us Belizeans that it was the legendary Belizean drama group, “Square Peg Players”, with whom she appeared as a revolutionary player, was one of the only sources of education besides Amandala that Belizeans got outside of the classroom. They connected Belizean grassroots society to the dynamics of Belizean politics in their explosion on The Bliss Institute stage. Smith-Lopez’s revolutionary monologues in “Genesis of Destruction” by Sandra Coye that expressed Belizean resistance against political power in Belize during the 1970s, were powerful symbols of protest. She became the first Belizean dramatist and actress to perform a monologue of the poem at the 1976 Caribbean Festival of Arts (CARIFESTA). It was also the first and only time Belize entered drama at Carifesta. She understood well by then how to use humor as a weapon against powerful political forces at that time, and she attracted a tremendous audience in doing so on the stage at the only Belizean theater called, “The Bliss”, and on the road in ballrooms across the country of Belize. 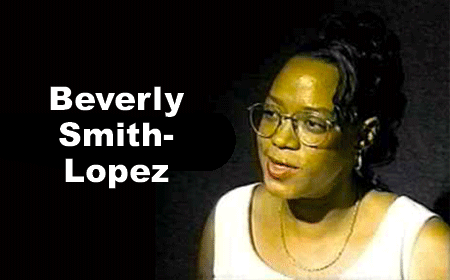 Before she became the National Director of Culture in Belize in 1994, Smith-Lopez had accepted an invitation by BREDAA, the Los Angeles-based Belizean grassroots organization (Belize Rural Economic Development of Agriculture through Alliance) to perform in one of its historic variety shows at the Veterans Memorial Auditorium in Los Angeles, California in 1992. With her awesome aura as one of Belize’s most funny and dynamic Belizean women of all time, she entertained the Los Angeles Belizean audience sharing nostalgic moments of old time Belize that received standing ovations. Her unique entertainment style brought pleasant laughter at those things truly Belizean to a diaspora far away from home. She became popular with the Los Angeles Belizean audience, making BREDAA’s variety show fundraiser a smashing success. It has become a most memorable time for me as well as my colleagues in BREDAA to reflect on Beverly Smith-Lopez’s beautiful personality as an artist of unique caliber. She is dearly missed. I came to know Beverly-Smith Lopez even better in 1999 when she had become the director of the then Belize Arts Council, and the politics of the day in Belize had entered a new phase of development. Unlike the times in the 1970s where Smith-Lopez became one of the activists in resistance against the political forces of the time, the beginning of the 2000s saw her in a new role but having the same passion for freedom, justice and equality in Belize. She had grown even more stronger in her views and direction as a Belizean artist and activist. During one of my discussions with her at her office at “The Bliss”, she had mentioned to me in protest that she had been going back and forth to the centers of power in Belmopan to hustle a budget to operate the center for performing arts, but that the politicians were behaving in her own words,”like they have stripes.” It became apparent to me that since Beverly’s outstanding performance in the Los Angeles Belizean diaspora a few years before, that this revolutionary artist and activist was not going to succumb to any one’s politics. Sadly, Beverly Smith-Lopez passed away before her dream of what she had envisioned for the arts in Belize may have been realized. Today, with the new Belize National Institute of Culture & History (NICH) that was advanced in 2003 under the leadership of Belizean artist, Yasser Musa , and also in 2008 under the leadership of another Belizean artist extraordinaire, Diane C. Haylock, it may be acknowledged that “The Bliss” became what Beverly Smith-Lopez may had envisioned it to be. It has to be said that there were so many Belizean artists who exploded on the stage during the Belize artistic renaissance” in the 70s, but the work of Beverly Smith-Lopez in Belize and her legendary work at the Caribbean Festival of Arts (CARIFESTA) in the 1970s would probably go down in history.